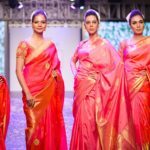 Your closet might be a safe heaven to hold countless designer clothing and carefully collected fashion wear, but if it doesn’t host a few traditional blouse designs to grace your silk sarees, chances are you are missing out a huge thing in life. Silk aka pattu sarees still remains the primary choice to embrace during intimate family occasions and yearly festive days. 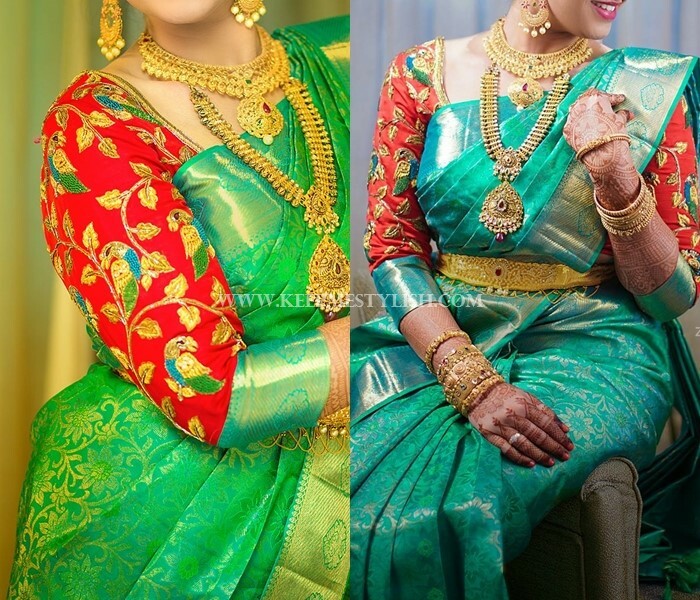 Not to mention the elaborate bridal events and the necessity to look impeccable in your expensive kanchivaram silks or equally alluring gem of silks like ikat, banarasi..etc. 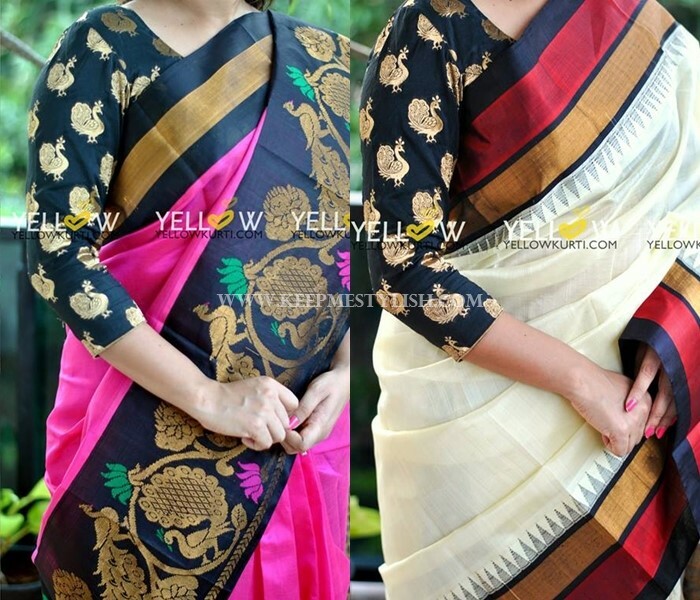 All these boil down to the fact that you are never going to stay away much from a silk saree. So it becomes more of a mandate to find out all the possible traditional blouse options that are trending this season. When you wear an expensive drape, you might as well get the best out of it. If you wondering what you should exactly do to your blouse, to make it stand out and striking, you can take this article as a first step. 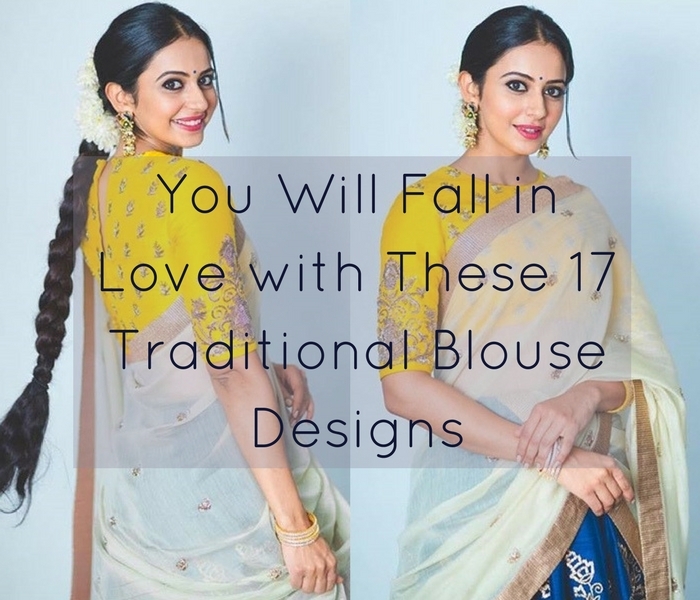 Here below we forayed plenty of online resources, pinterest pins and instagram feeds to analyse all the pretty blouse designs that makes a best bet to wear with your traditional silk sarees. Scroll down and see what they are, and take due notes to get your next blouse stitched in a notable way. Stones are not a new stuff. They have always been a great thing to adorn your saree jackets. To implement this classic material on traditional blouses, you need a bit of creativity. Without taking the conventional route of studding tiny stones all over the blouse, go for big bold ones and get the embellishment done around your neck and sleeve edges. You really don’t need any jewellery once you have your blouse stitched on this way. It will give a designer finish to your traditional blouse. If needed, play with colors to bring out the true charm. For instance, a big bold gold stones will elevate a black color blouse. White bold stones will be good one to try with deep red and maroon. 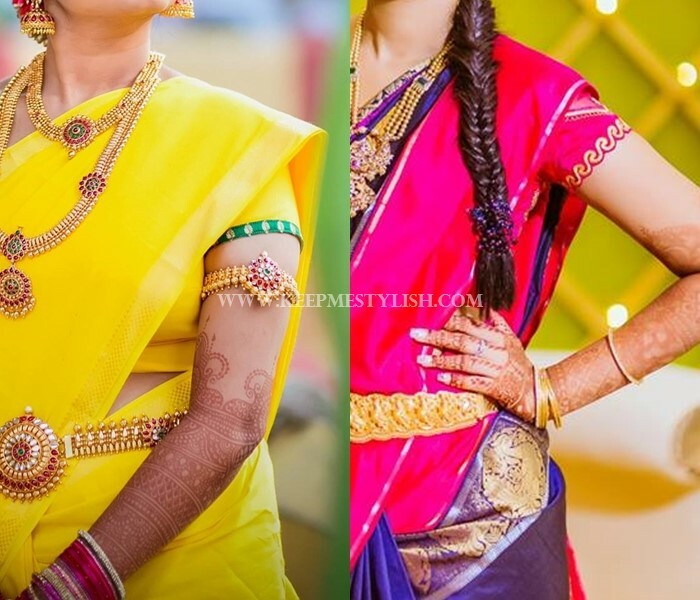 This is well known blouse model that is known to gel with a silk saree style. This is one of those blouses which don’t need anything else except for those short pleated sleeves to bring the magic to the saree. 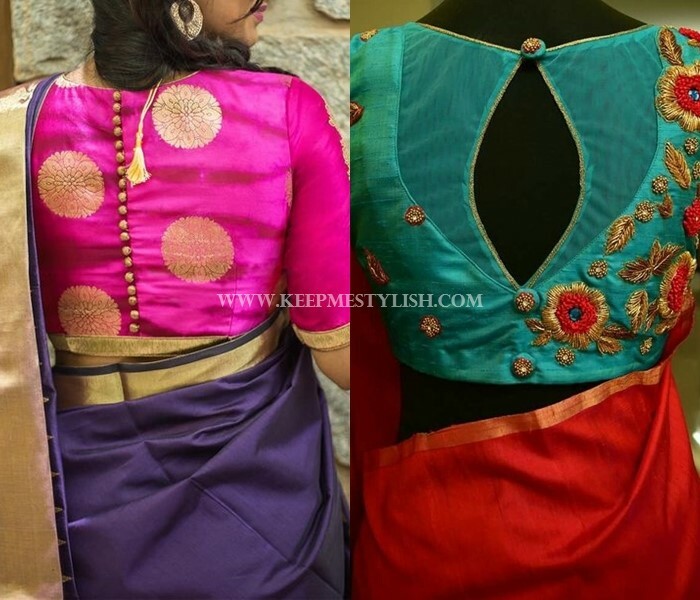 However, if you want to try something new, try going for little detailing around the blouse sleeves, or you could simply opt contrasting choice of colors to highlight this cute blouse with respect to saree. If your saree comes with a long zari border, chances are you will have a default blouse that comes along with saree with heavy zari work. Don’t let it rust. You can get innovative with this, and make your blouse a truly captivating one. Take advantage of long zari and flaunt it as your blouse sleeve. If needed, go for catchy embellishment (like stone work or kundan work) to balance the blouse with saree. 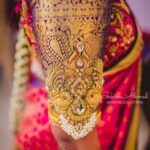 If you have been keeping an eye on bridal trend, you would have noticed that blouse sleeves with attractive patterns, is being coveted by every women. A simple square pattern indeed tops this list. You can get creative and try pleasing designs inside each square box. You can even highlight the designs with thread work in contrasting colors or even with simple beads work. Often simple designs are enough to boost your saree look especially if your saree is light weight and void of any designs. If such is the scenario, then you can stitch a simple blouse like below with a simple border work around the sleeve ends. If you plan to wear this saree for weddings, try with an arm band or vanki. It will look regal. Yes, the glittery mirror work is not just for your designer drapes. 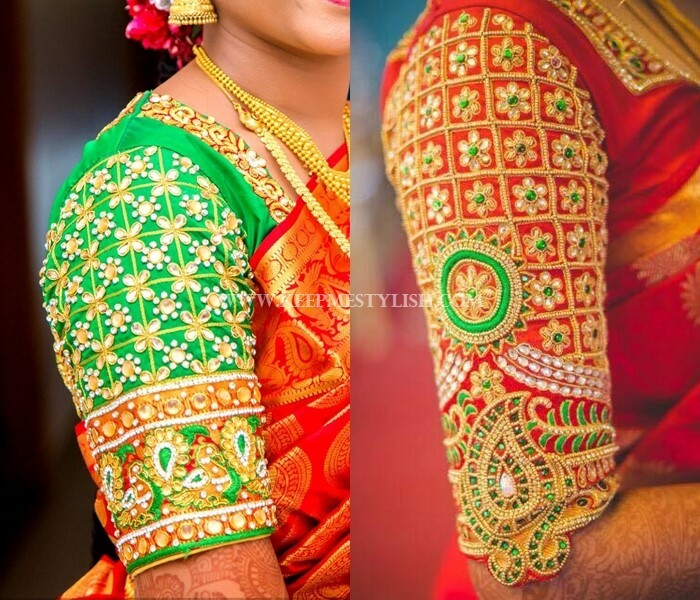 You can even make your traditional blouse look a bit unconventional by opting for mirror work on it. When you choose mirror work, make sure your blouse is of deep colors so the mirrors are visible. If you don’t like the shimmery undertones of mirror, instead of dense work, use it sparse so it can look less crowding. Another interesting pattern which has been trending this season is a heavily embellished silk blouse with square pattern and floral work inside. These blouses are generally made to look royal with a heavy stone work. If you are actually a bride or bridesmaid, then you need a heavy work blouse like this to flaunt on major day of your life. When two or more relatively different fabric or material is stitched together, it is called as patch work. This stitching is highly popular in traditional blouses because of the rich look it adds to sarees. While there are many interesting patch work available to try on blouses, one that seems to have caught the fancy of many is the bold squares and stone work around it. When it comes to embossing images on blouse, only few are being favored. 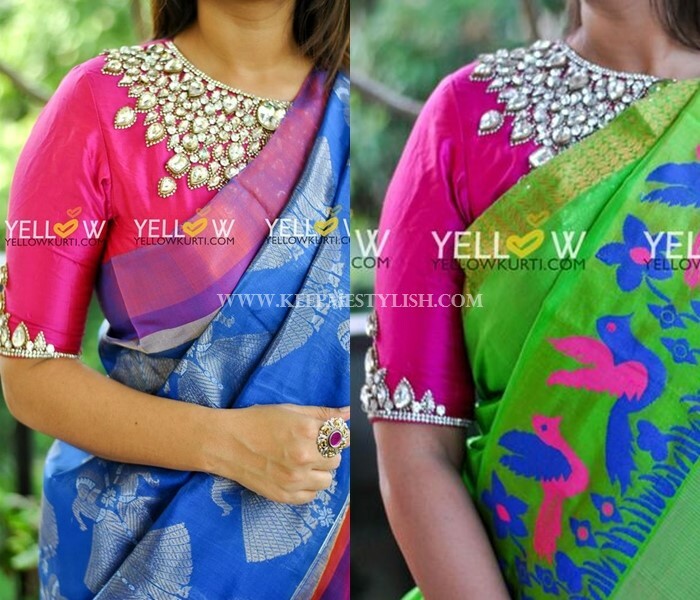 Next to florals, peacock designs are highly popular on pattu saree blouses. Get a heavy thread work done on your blouse with mesmerizing peacock motifs. Highlight them in the colors that gel with the saree. Surely you will end up in a lovely blouse style. 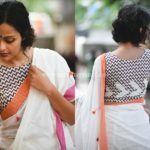 While the square pattern are given fashionable twist and turns to make it look bold and beautiful on pattu saree blouse, another interesting pattern to try this season is relaxed waves like the one below. 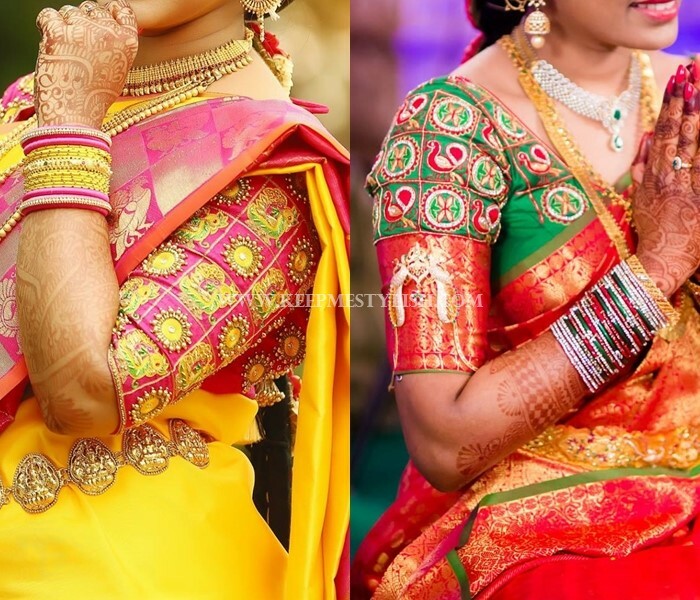 These blouses make an out of box combination for expensive Banarasi and Kanchivaram sarees. 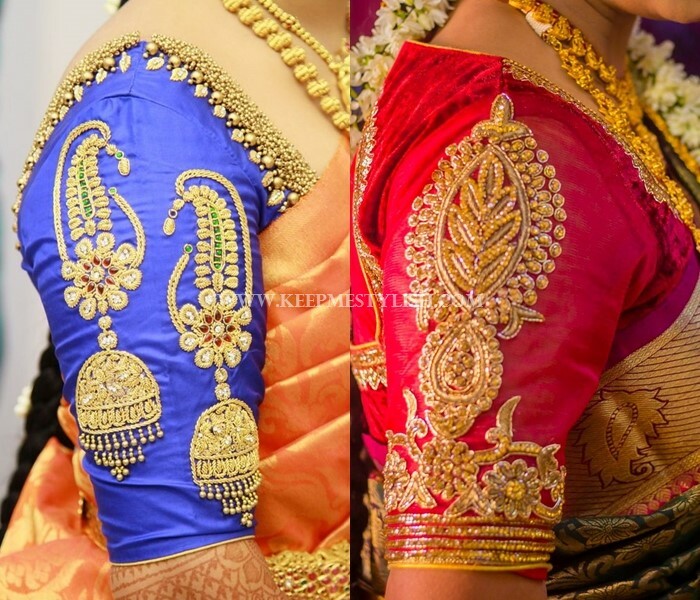 Simple gold blouses often make a perfect choice for any silk sarees irrespective of colors. Owing to its flexibility, it is always a great idea to own one exceptionally well-stitched gold blouse. Any time you run out of blouse style, just go and grab it to lighten up the day. You can either opt for a plain gold blouse or if needed get nice thread work done on it to give a grand look. How can we forget the brocade blouse which is always a best pair to try if none of the other blouse is too heavy to try. 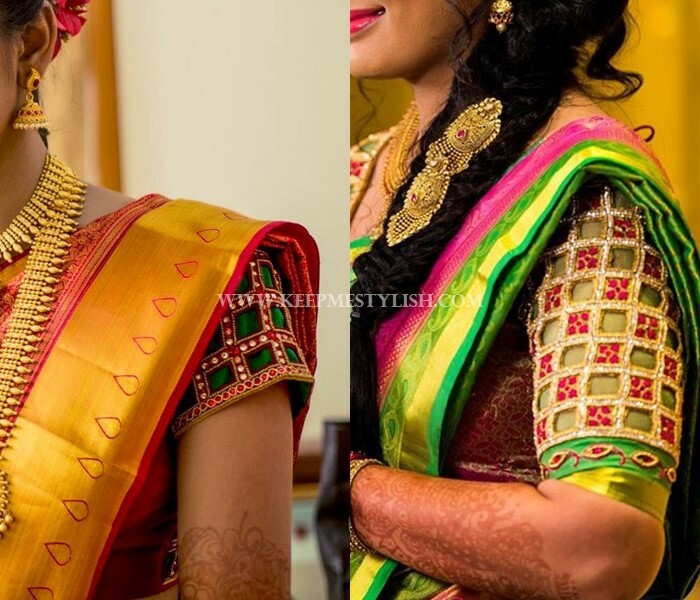 Brocade blouse with creative motifs still remains as one of the best blouse option to try with pattu sarees. Bored of stones and beads, bored of classic patterns, then it is high time to make your mind run wild and be creative. Innovative thread detailing in aesthetic colors is surely a must try for those who love to go any length to keep their blouse flawless. 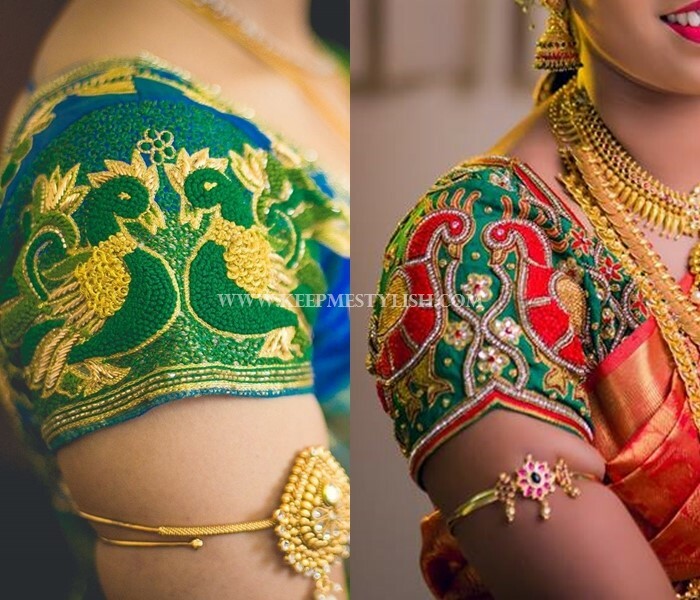 These days, especially for wedding blouses, brides are interested to come up with innovative themes to grace their blouses. Themes vary from embossing bride and bridegroom face, traditional accessories and other interesting elements that are catchy and attractive. This season is all about animal prints and motifs. Your traditional saree blouses are also not spared off. 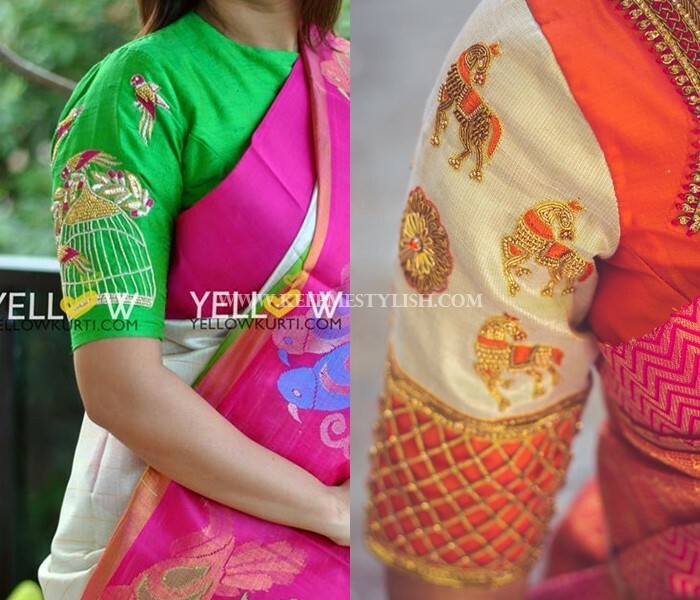 Make horses, elephants, parrots embellish your saree jackets and be sure to get heap of compliments. 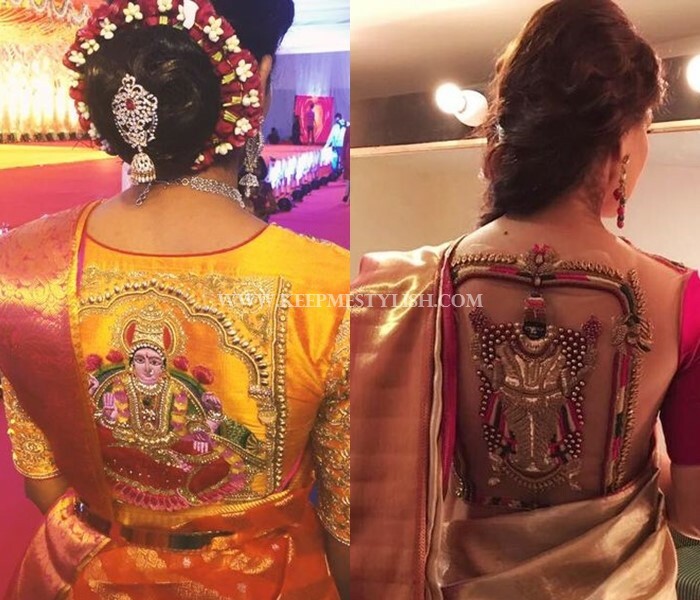 Blouse back side offers lots of scope to make your entire saree style unique and effective. One particular trend that has caught our attention is the bold intricate detailing of god and goddess image with colorful thread work. This makes the best traditional statement blouse of this season. Even though the topic is all about getting the perfect traditional blouse, you don’t have to drop your fancy notions completely. Give a modern touch to your blouse by trying out beads, tassels and other trendy back necks on your blouse. Of course, they give such a good fusion look to your sarees. We have come to the conclusion. Your traditional blouse designs can be as attractive and enchanting like your designer collections. All you need to do is take one of the options above and give your own personal style to come up with a blouse design that suits you. 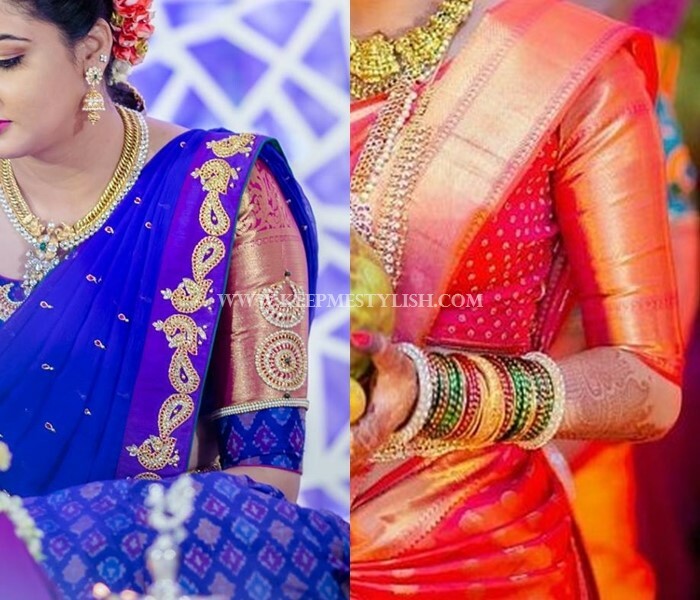 What is your choice of blouse choice for silk/pattu sarees in the above list? Drop and let us your know your comments!